I love the smell of Coppertone in the morning. Took me a good two hours Sunday morning to decide if I was going to make the trek back out to Zilker to finish out the fest. It never officially devolved into a pro/con list, but glancing at the schedule and knowing that the stuff I really wanted to see was either not happening at all (Rodrigo y Gabriela, my primary reason for heading to ACL in the first place) or happening while I was on a plane (Wilco, Decembrists, Preservation Hall Jazz Band, Dylan), it was tough to make the justification. But then I remembered that this trip was all about exploration, and while I'd probably get some great breakfast tacos (apparently the national food of Austin) by taking Sunday easy, I'd probably kick myself If I didn't go. I mustered a shower which, while refreshing and needed, didn't really spark up the engine. It wasn't until the final touch before heading out the door, the application of the sunblock (thank the lord and good chemists) that I really got fired up again. Weatherwise, the day was perfect...ly identical to the previous two: warm with scattered patches of warm. But once you get that first good sweat on, get your bearings and a general idea for the day (at least to the mid-afternoon, in this case), it becomes about hoofin' it around to see/hear music you've not seen before. In the end, I was pleasantly surprised by what I experienced Sunday, and had fun wandering the periphery of the grounds to at least visually take in every nook and cranny. By 4:15, when I had to head out the Town Lake exit, still scratching my head (in a good way) over the musical enigma that is DeVotchKa, the festival felt complete. I accomplished what I set out to accomplish, heard and saw bands that I will continue to keep my eye on as they make their way to my neck of the woods. I met new people, made some contacts, developed a renewed sense of respect for the other "live music capital of the world" (I'll still take Nashville as an overall living experience), ate some great (and not so great) food, and basically just had fun. Oh, yeah, I wrote about 5000 words, too. Now that's what I call a vacation. 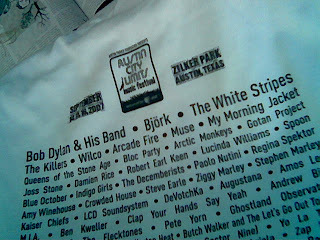 The good news: they had a ACL Fest T-shirt in Large Land Mammal size. The bad news: it's white. The good news: it's a Hanes Beefy-T, which means it won't shrink if I play my cards right. The bad news: the White Stripes, Rodrigo y Gabriela and Amy Winehouse (wait, is she on there, I haven't really looked) didn't play the festival, but, them's the breaks. Drat you, long lead screenprint jobs! Drat, I say! The promised mosquitos never really manifested themselves, but there were dragonflies about as big as your head. Felt like I was in a Hitchcock film a couple of times. Sunday's Second Find: L.A.'s The Broken West, unpretentious 2GBDK (two guitars, bass, drums, keyboards) rock und roll. Ran into Will Hoge at the airport and he said they'd be touring with Hoge in Colorado in a month or so. I'd see that bill in a minute. Might even pay for it...ah, who'm I kidding? Usually at things like this, there's a visible hierarchy based on the types of laminates you have. People eye them covetously, and angle every which way possible to acquire the one that gets them the best access, usually to food and clean bathrooms, really. But at ACL, only certain staff members had laminates. Everything else was about the wristband. But every once in a while, my eyes would flash on somebody wearing a lanyard, only to see the ACL iTunes gift card your paid entrance got you. The democratization of the laminate happened right before my very eyes. Attempted another experiment Sunday, but it didn't pan out. 'Twas going to see if I could every stage featuring music for at least one song during the 2:30-3:30 hour. (Hey, you do what you can to amuse yourself/generate content ideas.) Started with the AT&T stage at the far east of the grounds for Ben Kweller, then headed counterclockwise to the WaMu shed for Grace Potter & The Nocturnals (another one to keep an ear out for, B3-playing chick with seriously smoky vocals), then to the Austin Kiddie Limits stage for something called Q Brothers. But the plan got halted when I finally made text message connection with a friend from the Citysearch days, and we made plans to connect at the press village. Seriously...how did we ever do these things without text messaging? 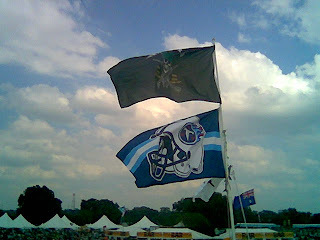 The prevalent user generated landmark for ACL was the flag on the flexible pole. No longer can you just yell into a cell phone, "Hey, look! I'm waving! To your left...more...too much..." etc. (Well, unless you're, you know, me. 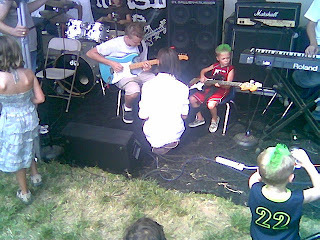 Only saw one guy the whole weekend taller than me, and even then it wasn't by much.) But there were flags everywhere and of every affiliation: UTexas, Dallas Cowboys, Texas, pirates, happy faces, Aussies, Swedes, the Swiss flag, Marines, you name it. There was even, yes, a Titans flag waving proudly even in defeat. Headed to the exit while listening to DeVotchKa, an interesting acoustic/Eastern European influenced outfit out of Colorado. It was good to leave the fest still having that sense of exploration intact...but, after about 24 total hours in a park over the course of three days, it was time to G.O. The plane back to Nashville was packed, as you might imagine. The guy sitting next to me was wearing an artist wristband that clearly had some wear on it. He may or may not have been somebody I should have talked to. Didn't matter. I needed to be in my own world, and on a plane, I can do that easily, despite how much space I take up. Knocked off about 60 pages of "Bird By Bird," and slept. Time to head back to the real world.